Hi all! First of all I have to say how crazy the last few days have been. We are winding down summer around here, which means school is back in session soon, tomorrow actually. Yikes! Anyone with kids knows how hectic of a time that is. We also took a trip to visit my Grandma in Southern California and was soaking in all of the time with her. I hope to share some pictures of her home here soon. She is all about the beach and coastal decor too, it must be genetic or something. 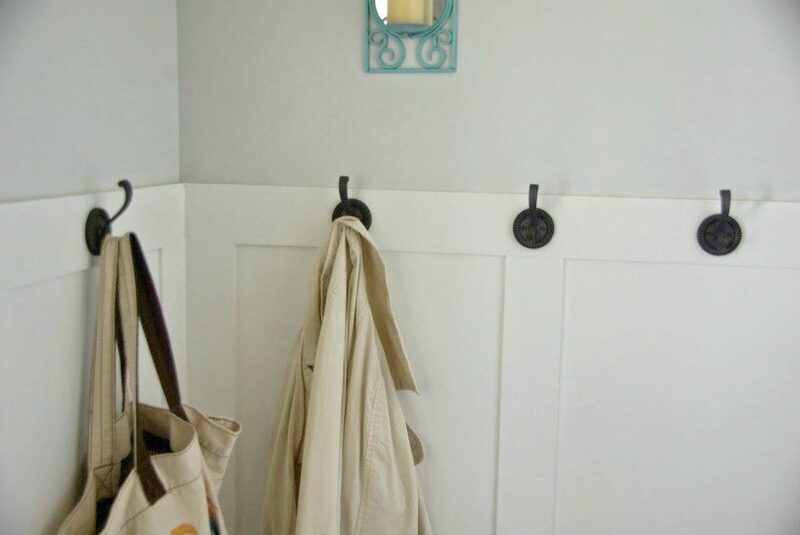 Anyways, with all of this talk of visiting with people I realized how great it is to have a designated entryway for guests to come in, hang coats or purses. I like to have this not be smack dab in the middle of the living room. But, what do you do if there is not a technical entryway? 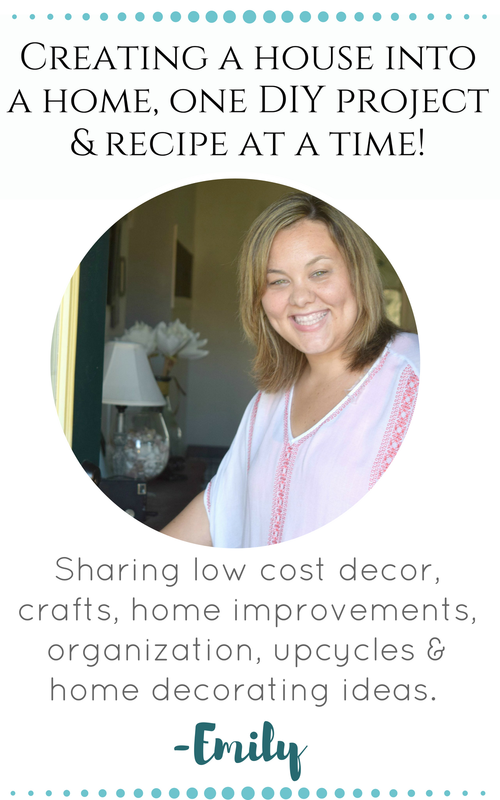 I am going to explain How to create a designated entryway in your home by sharing how I created that space in my home. Here is what I was working with years ago, a carpet (formally white turned into dirty looking beige). When you walk into my home you are smack dab in the middle of my home. You see the dining room and the living room right away. There is zero foyer to speak of, and no transition into the home. I have a small little alcove and a closet which works great for us but it is a cramped space that no one ever actually notices. My first few attempts at doing something with this space was rough. I put a random table, an empty picture frame… um…. yeah… no clue what that or the rock was doing here. Moving on…. Like many people I dream and stalk Pinterest board to get together my dream home. Most of my dreams include a grand foyer to walk in, have guests come in, linger, take off their coats and have a place to have us greet them. Living in Wisconsin we typically have a line of people waiting to come in and take off their snow boots and gear in winter. The grand foyer is pretty but very functional. Since I cannot do anything about the lack of a larger space, I can do as much as I can to make the entryway functional. Most importantly make a definite space to even call an entryway. Separating our living area from the front door. 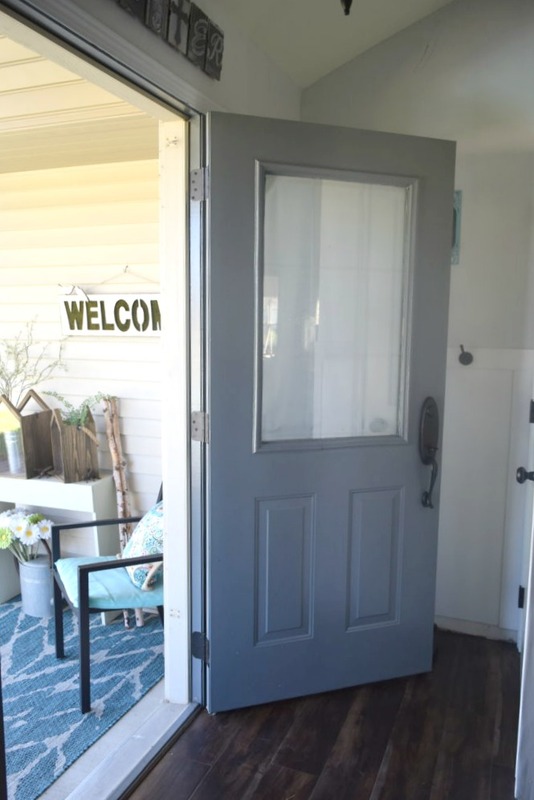 Our front door recently got a makeover, adding the gray color to it gives this entryway the best pop of color. I shared the tutorial to painting the door here. The front door color is a contrast to the rest of the paint colors in my living room. Admittedly they are all a shade of gray, but the door is a much darker shade. Having the door be a different color than the wall color helps define the entryway. Adding hooks is an obvious way to add function. I try to keep these available for people visiting to put their coats or bags. We use the front closet to hold our winter coats and other items, so having our guests use it is not an option. Also, because this space is so small the closet door cannot be opened without the front door being closed. It causes a weird little dance to make both doors work right. I decided to eliminate that issue and do not open the close for guests to put things. Maybe one day I will remove the closet door and turn this into more of a nook space, which then can be used easier. 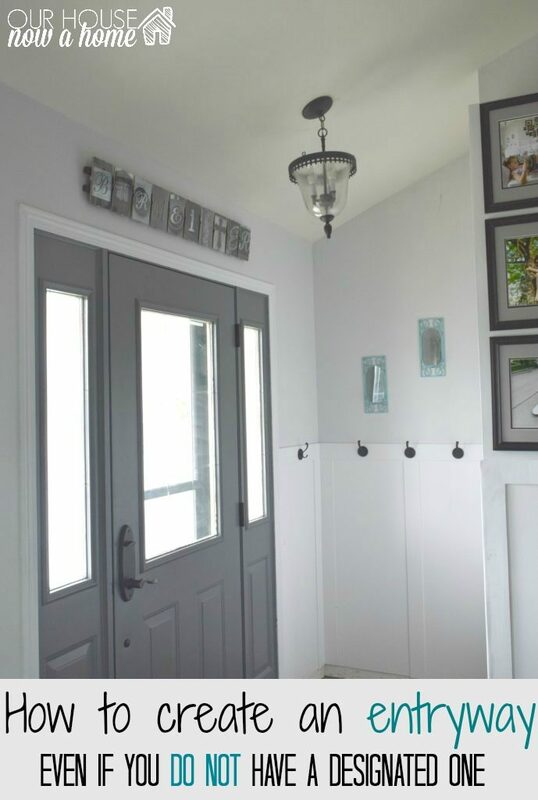 The ceiling light by the front door is another way to make a foyer-like feel to the entryway. 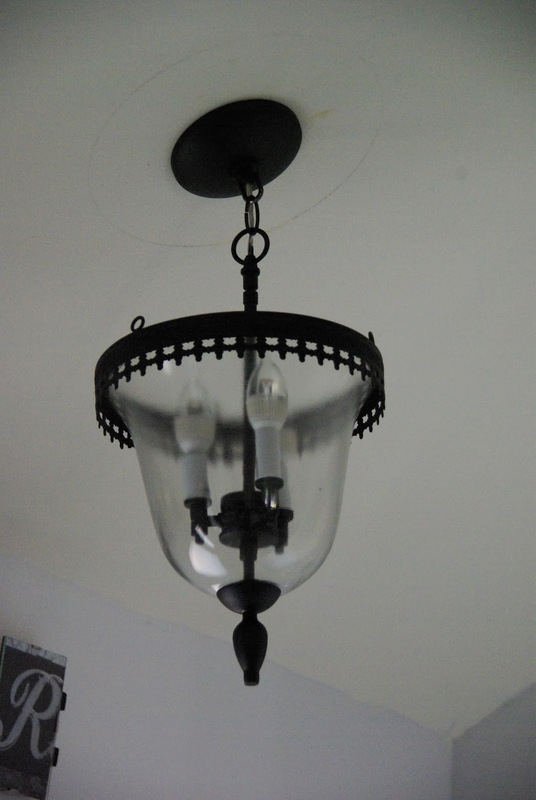 I have vaulted ceilings in my living room so was able to add a little drama to the space with this light. However, putting up a flush mount light with a more fancy feel to it in the entryway can help in defining the space as well. As you can see from this view from the front door, when entering our home it is very open concept. Although at least the kitchen is hidden. 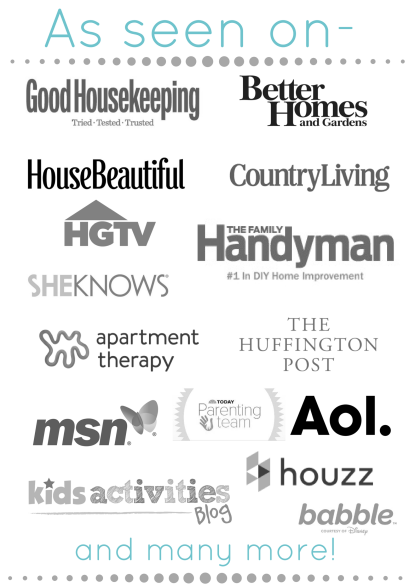 I do not get those DIY TV shows where people knock down every single wall in a home. I do not need to see dirty dishes in my sink from my living room, that I can do without. 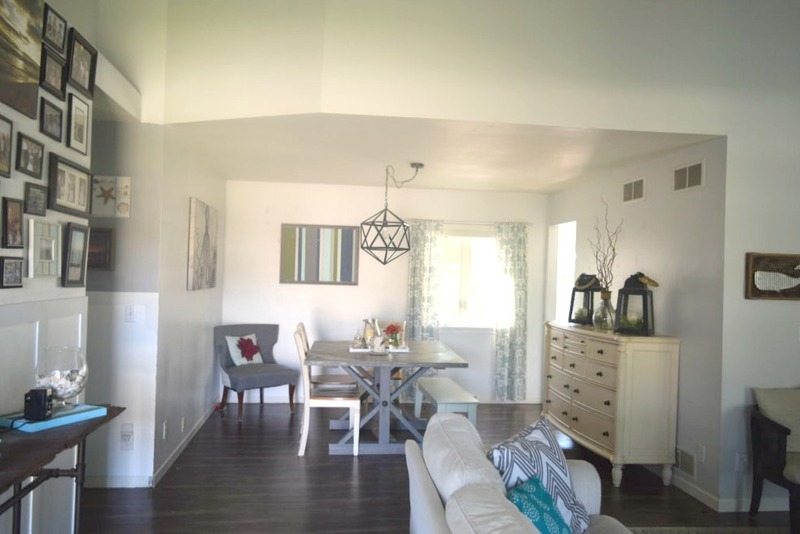 I wanted to find a way to visually separate the living and dining room from the front door. I considered a different paint color, possibly different flooring. 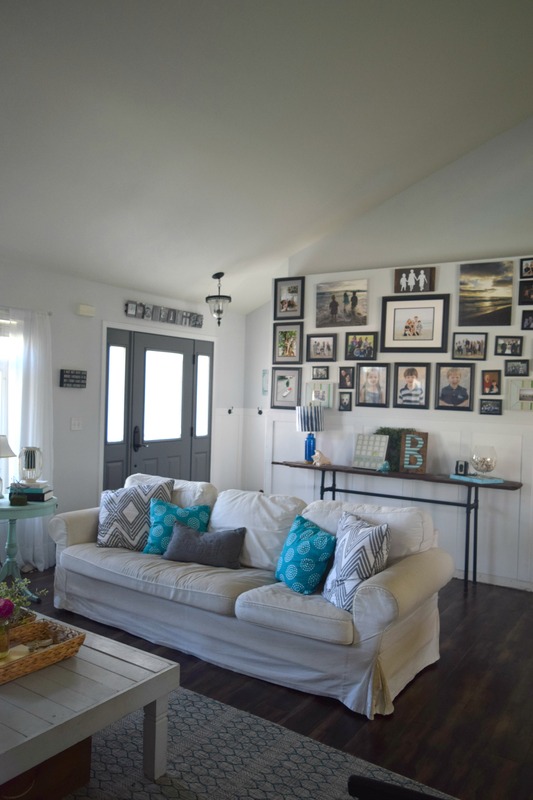 The final decision was putting wainscoting on the far living room wall and the small, tiny nook off of the front door. This does not go into the rest of the living room and I love the transition it gives the space. When trying to create a designated entryway in your home the furniture placement can be a huge advantage. When we first purchased the home I had our sofa facing the front door. Once I rearranged things and put the sofa in the center of the room, with its back to the door there was an obvious visual separation. 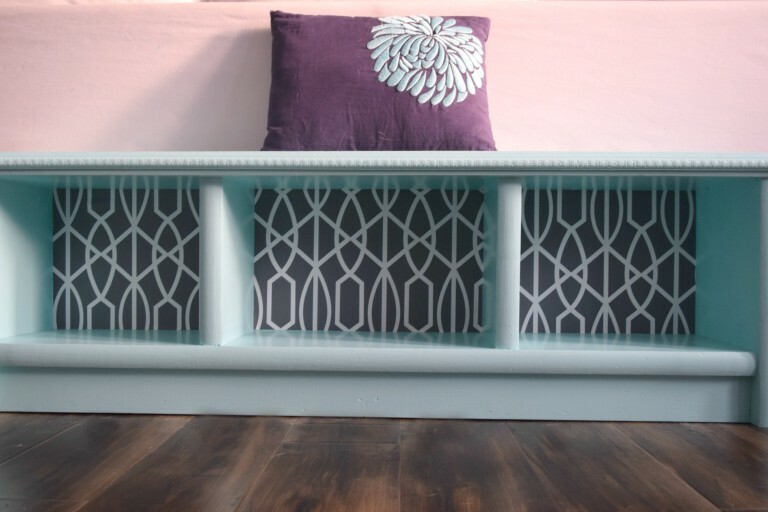 I created this DIY console table with this specific wall in mind. With this being a “walkway” into the rest of the house I knew nothing too bulky could be here. However, leaving the wall blank, even with the wainscoting made this wall feel unfinished in the decorating department. I felt a long and narrow console table was the best solution. When we have people over I clear off a little more of the table surface for items that tend to be set down by guests. 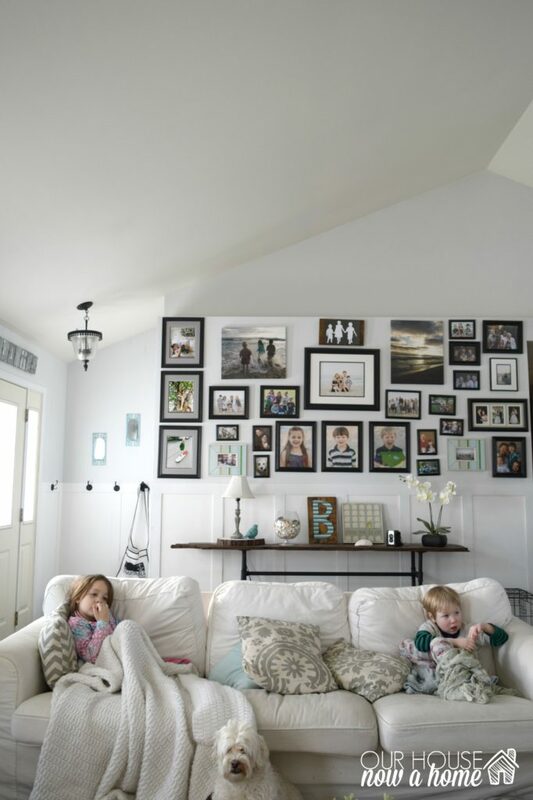 Making the space be versatile is key. Having furniture that has a double duty is always a good thing. I made-over this bench with cubbies in it. 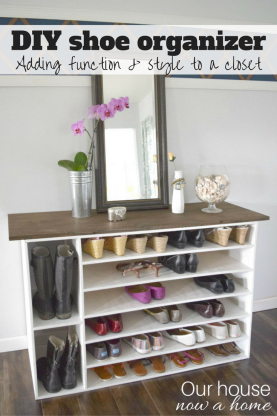 Having a space to sit and put on shoes, or to set things on top of and in is another way to make the entryway functional. With this bench being slightly away from the front door it gets people into the home without cluttering up the actual door. When I moved the sofa I was able to put this bench directly behind the sofa. Making the empty space useful and also pretty. From a decorating perspective having something behind the sofa looks best. My home is of average size, not too big or too small, but I still have to get creative with how I use it. 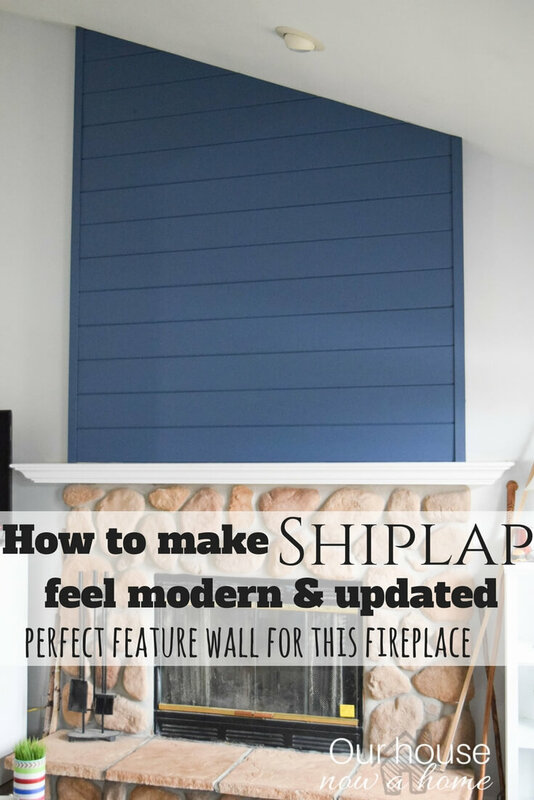 With a family of 5, two dogs and a large extended family and my love for entertaining our home has to have a few functions. I want it to work for us on a day-to-day basis, work when entertaining, and also work in a way that fills this decorating loving heart full of happy feelings. All of that combined can be a random set-up. 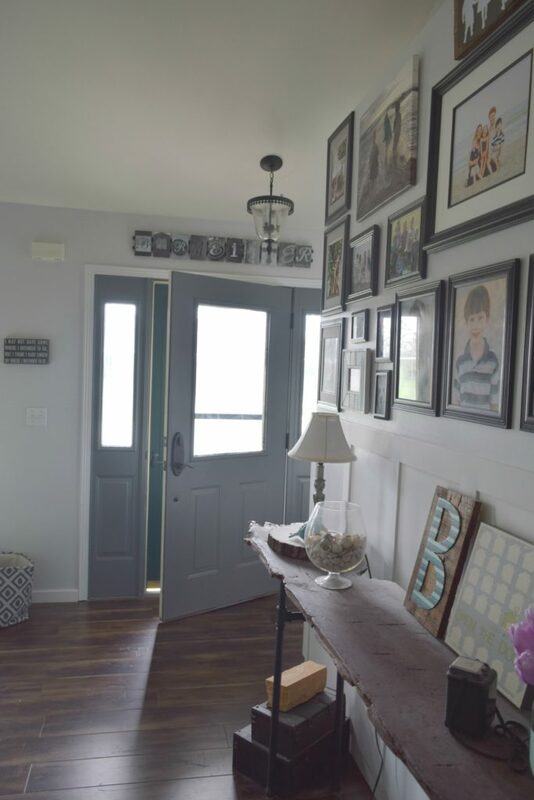 Carving out an entryway, not taking up usable living space, and having an ease for guests to enter and store items all help me keep that full home even more full with activity, people and memories. Taking the steps of defining the entryway with a contrasting front door, wainscoting and well placed furniture for function help bring the elements of a foyer without the desired space. 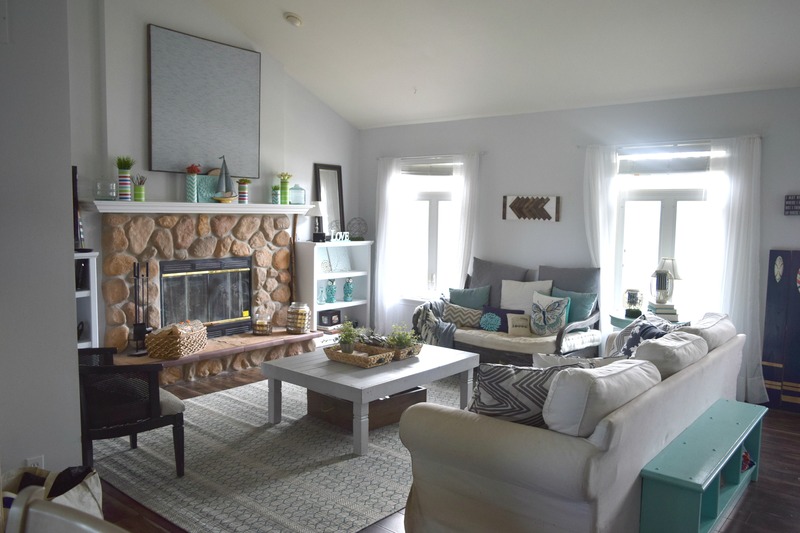 Arranging the living room furniture gives even more of a visual barrier between the two spaces. All without knocking down walls, or having to win the lottery! 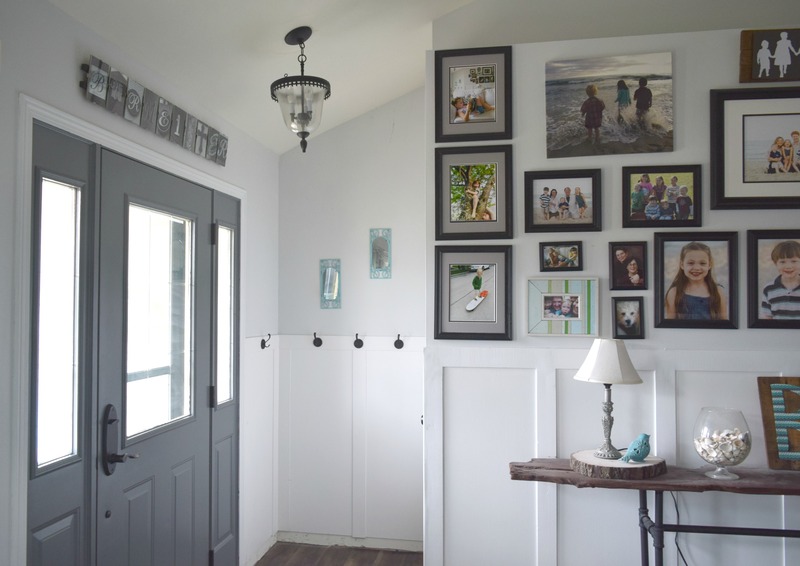 As with most things I share here How to create a designated entryway in your home can be achieved with a few ideas, low cost solutions and creative thinking. 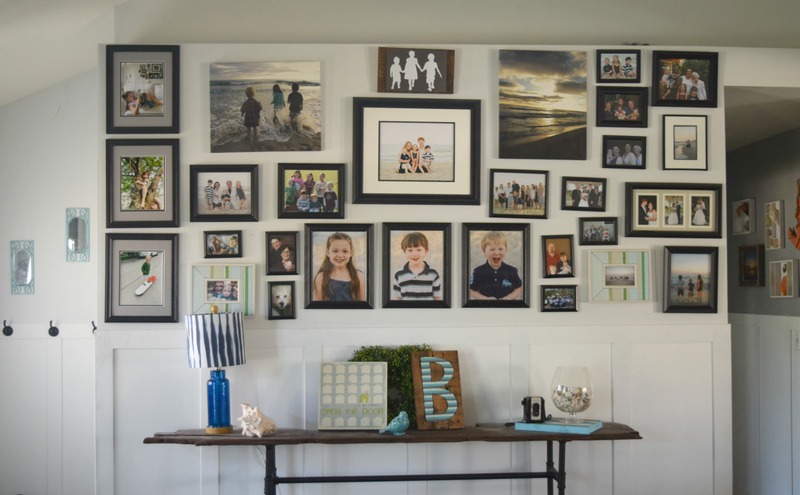 With most areas in decorating the home getting creative can be all that is needed to get that dream home. I hope to one day have a grand foyer to greet guests, for now this tiny entryway works and welcomes people into my home just fine. On another note, sorry I have been MIA around here lately, spending the much needed time with my Grandma and family came last minute so I did not have much prepared to share here. 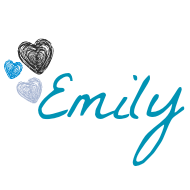 My kids start school tomorrow and I am officially a full-time blogger! 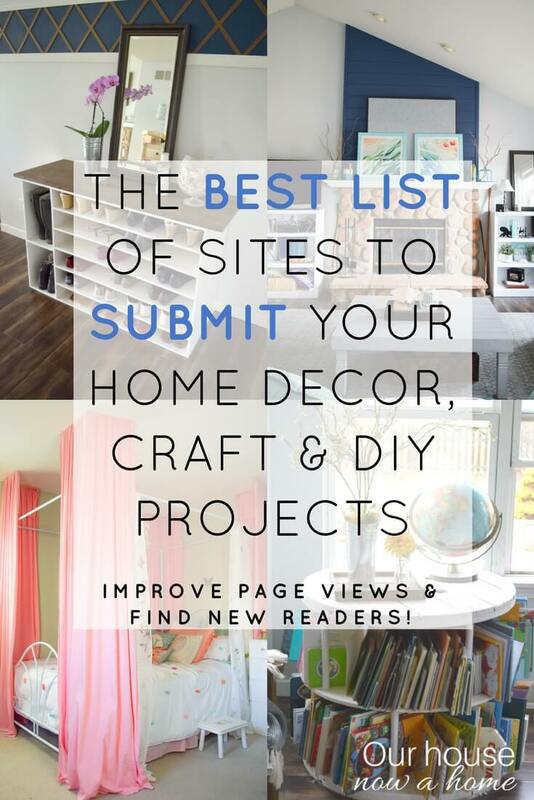 Which means more ideas, posts and decorating. I am so lucky to have you all here with me on this journey of decorating my home, sharing ideas and creating my house (and yours) into a home! Thanks so much everyone and things will be back to normal now, with some big time DIY projects in the near future! 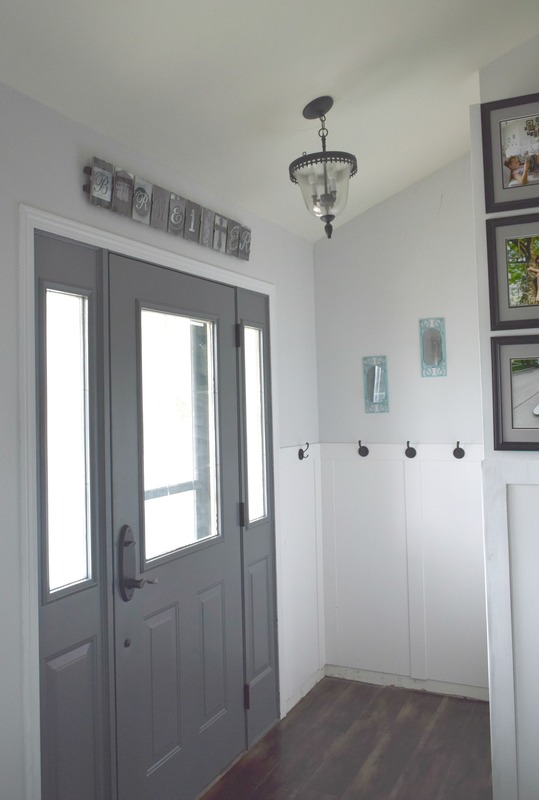 Do you have a designated entryway in your home? If not, how have you managed to create a space for storage items or ease of entry for your guests? What a great job you did on your home. It looks wonderful. I really enjoy all your post. Thank you so much for reading along! I am so happy to have you! I had a photo gallery in my old home and I loved it. I like yours and the people cut out is cute! Thank you so much Kathleen! I try to share real ideas, we all have a messy life on a good day. My home is decorated and I love it but this is first and foremost my families home. I am so happy you enjoy reading my blog and ideas! Thank you! The hooks are such a nice addition. I wish we had a designated entry way (or mud room), but sadly our house isn’t designed for it. That is so difficult to have, it makes dealing with traffic in and out of the home hard to handle. Oh wow, that is a tough spot to have an entry. The kitchen is chaotic as it is! First of all, I love the colour of your front door! 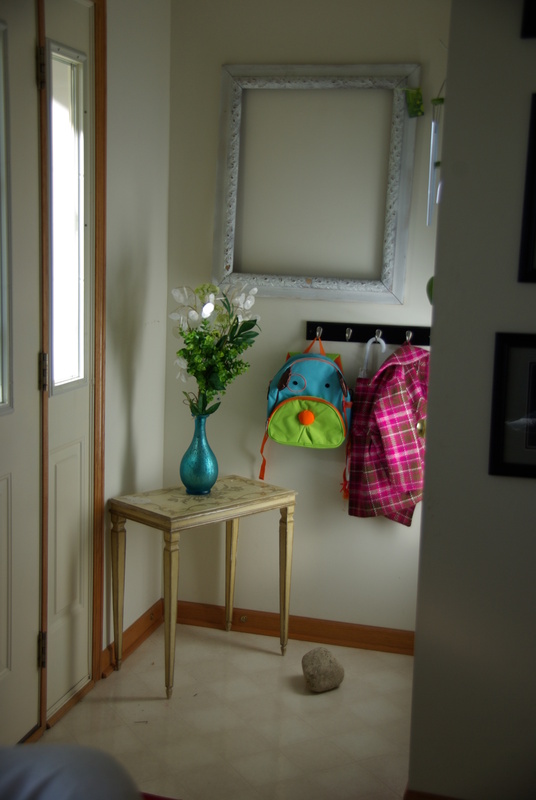 You have done a wonderful job of creating an entryway in your home. 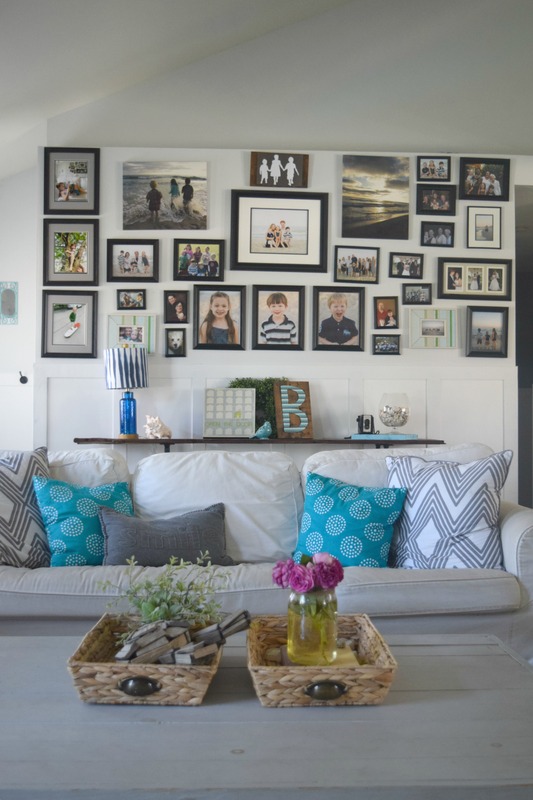 I really like your collection of pictures and the console table, and what a great idea to use the back of the sofa in that way as well! Thank you so much April! I have put a lot of work into this entryway and the thoughts behind it. Love the hooks. I have been telling my husband for years that is what we need at our entrance. They looks great…and work well too. Thank you! Hopefully you and your husband can get on the same page and make it work for you! I actually have the space to pull that off. I think you’ve inspired me to give it a try. Having no entryway is difficult, hopefully you can figure something out. You Did A Fabulous Job I Love It. I Just Moved In My New Home I Will Be Using Some Of Your Ideas. Love The Hook Idea And The Long Table With Such Pretty Things On It!! Congrats on the new home!!! 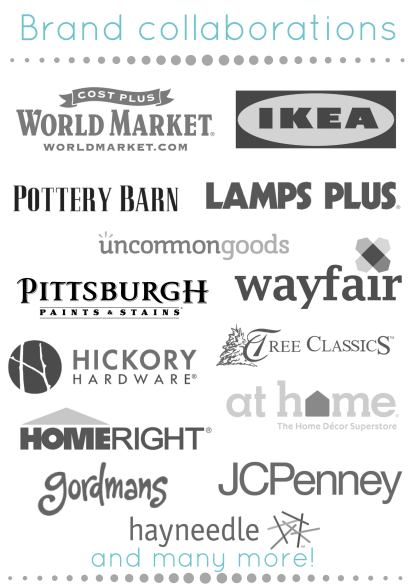 You’ve definitely given me some ideas for what to do with my entryway. Love the way yours turned out. 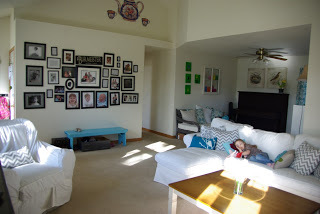 We have a similar entry and I have wondered how to carve out an entry way from my living room. 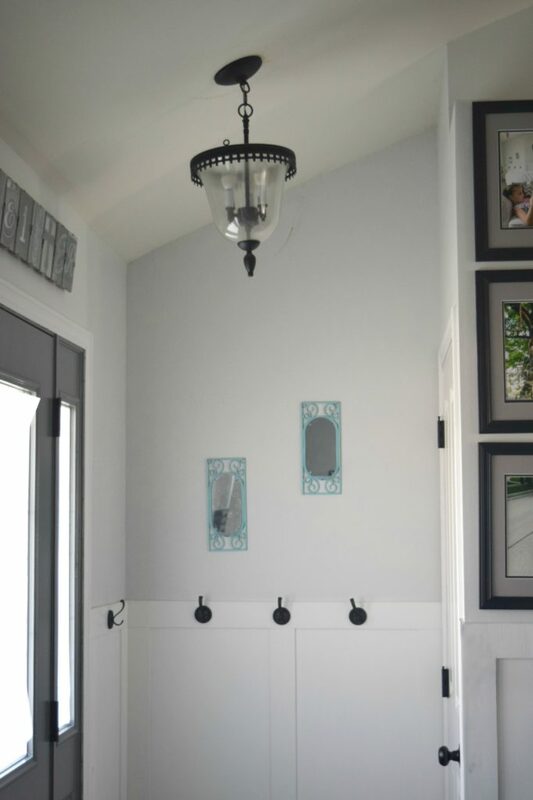 I really like what you did, especially with the wainscoting and the beautiful blue bench. Nicely done! You have a beautiful home! I hear you on this summer being crazy so big kudos to you for making the time to do this project! We don’t really have an entryway because the front door opens STRAIGHT into the living room. The layout drives me nuts, so I just have to deal with it, lol! Great job on yours! Thank you! Summer is so hectic, now with the kids back in school I have more time to decorate and work on my blog! Awesome! I am so happy you found this helpful! 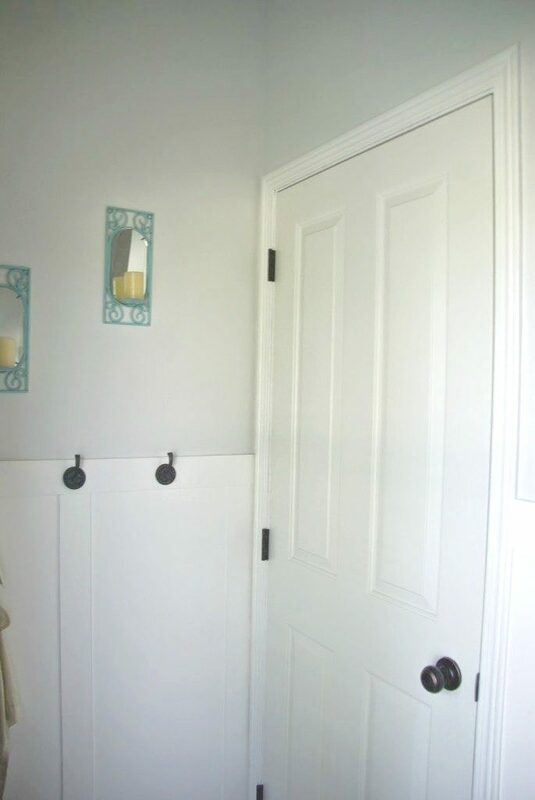 I love the wainscoting in your foyer area, Emily! 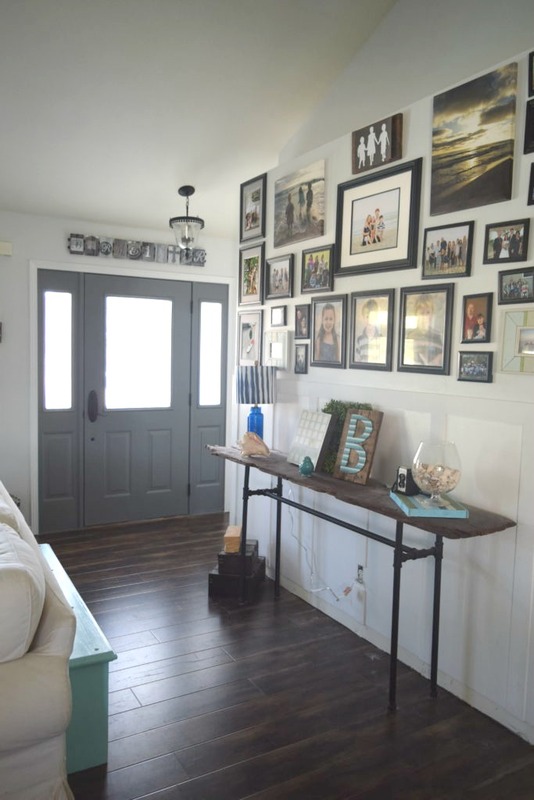 The color of the door looks great and really blends in well with the space. I’m so glad you had time spent with your grandma in Cali. My gosh — congrats on your full time status as full time blogger. I bet plenty of wonderful projects are already planned! Thank you so much Tee! Today was my first full day of no kids and it is amazing what I am able to get done!